Physiognomy and hexagrams I Ging. 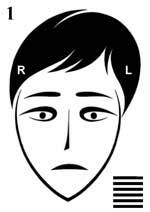 Visual testing on asymmetry of a human face. Attributes of phlegmatic and melancholic temperament as logic and intuitive functions are obvious.